Chicago, IL - Alliance Steel, LLC, a full service flat rolled service steel center headquartered in Bedford Park, IL (Chicago), has installed a new high-production Single-Loop Triple-Head Turret Head™ Slitting & Packaging Line with a shape correction Cluster Leveler™ in its Bedford Park, IL, headquarter facility. The new equipment has the capacity to slit and shape correct 60,000# x 72" wide hot rolled black, pickled, cold rolled, and galvanized carbon steel coils in gauges from .015" through .250", at processing speeds to 1,000 FPM. 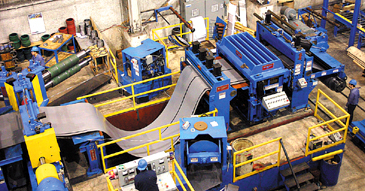 Compact High Pass Line: Alliance Steel, LLC's Slitting Line is an example of Braner/Loopco's high-performance, compact high pass line configuration, where the processing section is elevated above the floor level Uncoiler and Recoiler. The high pass line configuration processes the strip without reverse bending against the natural coil set. High pass line benefits include quick and easy coil threading, elimination of reverse-bend coil breaks, and elimination of strip surface damage from deflector roll scuffing. The compact high pass line allows the Uncoiler and Recoiler to be tucked close to the entry and exit equipment, which reduces the length of the line. The compact line conserves floor space, speeds coil threading, and provides outstanding coil tracking, which results in tight, straight sidewall coils. 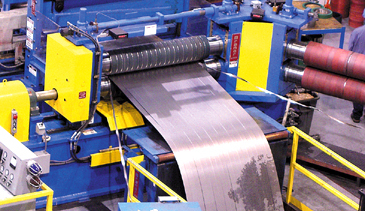 60,000# x 72" x 1/4" Single-Loop Triple Turret Head™ Slitting Line with a Computer Controlled Cluster Leveler™ produces precise tolerance slit coils while correcting edge-wave, center-buckle, and cross-bow strip shape defects. With the strip wrapped securely on a deflector roll with no reverse bending, the high pass line configuration allows superb master coil tracking. A non-contact hydraulic servo Edge Guide automatically tracks and aligns the coil edge into the Slitter at all speeds. Pushbutton adjustable Roller Guides with electronic position readouts make coil threading and tail-out fast and effortless. A Hydraulic Guillotine Shear crops coil heads and tails, and collects the scrap in a Scrap Car for quick disposal. Turret Head Slitter™: The 150-HP DC motor powered quick-change Triple Turret Head™ Slitter produces precise tolerance slit strips with minimum burr throughout the entire range of gauges and mechanical properties. 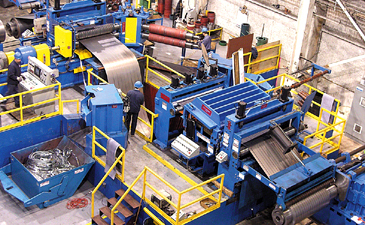 With three slitter heads, Alliance Steel, LLC is able to conduct a highly efficient just-in-time production and delivery program, and respond quickly to customers' urgent needs. Alliance Steel, LLC's Turret Head™ Slitter is equipped with three slitter heads supported in huge one-piece stress-relieved and precision machined solid steel bearing housings. The rotatable Turret is supported on a precision, anti-friction ring bearing, which assures precise arbor alignment and allows effortless one-minute head changes. The slitter heads at the "set-up" station are wide open and accessible with no housings, bases, or structures to impede tooling removal and installation. Free and clear slitter head access and quick-change ability gives Turret Head™ Slitter users the ability to make more set-ups and head changes per shift than with any other multi-head slitter or tooling transfer design. Turret Head™ Slitters are equipped with multiple "integral" slitter heads that do not detach or uncouple in order to change heads. The one-piece integral design makes Turret Head™ Slitters more rigid, more precise, and more reliable than any other slitter or tooling transfer design. 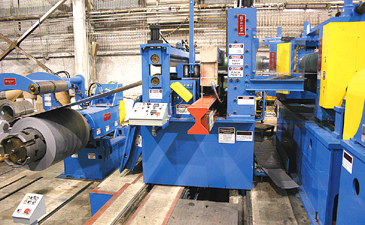 Strip Guiding & Tensioning: Alliance Steel, LLC's Slitting Line is equipped with a Pad Tensioner that generates the strip tension necessary to produce tight, straightwall slit coils. Tension is adjustable and regulated from the main operator station. Strip separator tooling is mounted on lightweight aluminum alloy arbors that exchange with pre-tooled arbors in sixty seconds. Unique "slide-out" tension pads exchange with resurfaced pads in sixty seconds. A Hydraulic Guillotine Exit Shear squares coil tails and splits coil ODs. The Overarm Separator is firmly attached, from both the inboard and outboard sides, to the Exit Unit frame. This design eliminates Overarm frame deflection and resulting misalignment that results in coil sidewall scuffing and coil oscillation. Exit End equipment generates strip tension, crops coil tails, and guides slit strips onto the Recoiler.